We arrived in Whitehorse on the 26th and did some city chores. We could not wait to get out of the city! Our destination today was the Klondike Highway and the Silver Trail to Mayo. 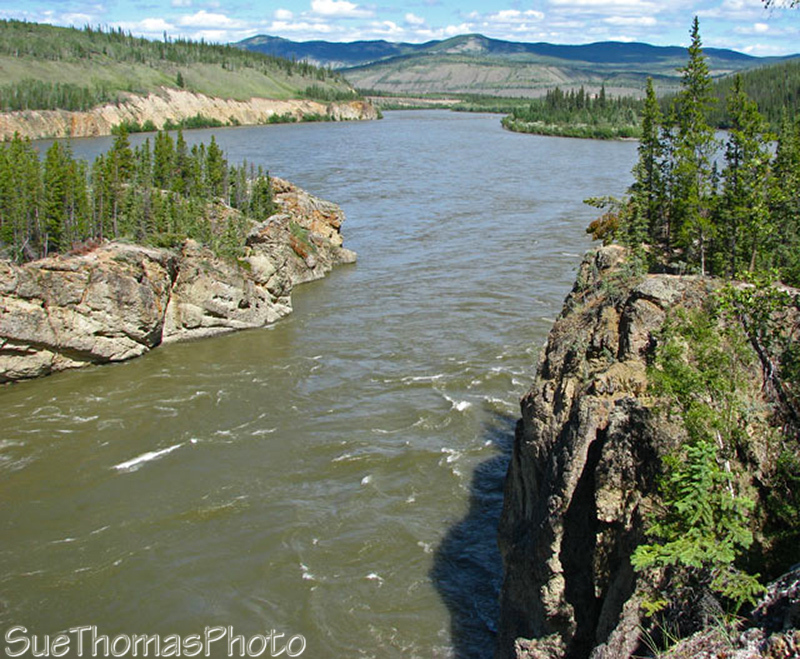 Five Finger Rapids oozes history on the Yukon River. From the highway, it looks like any old bend in the river with a few rocky islands in the middle. 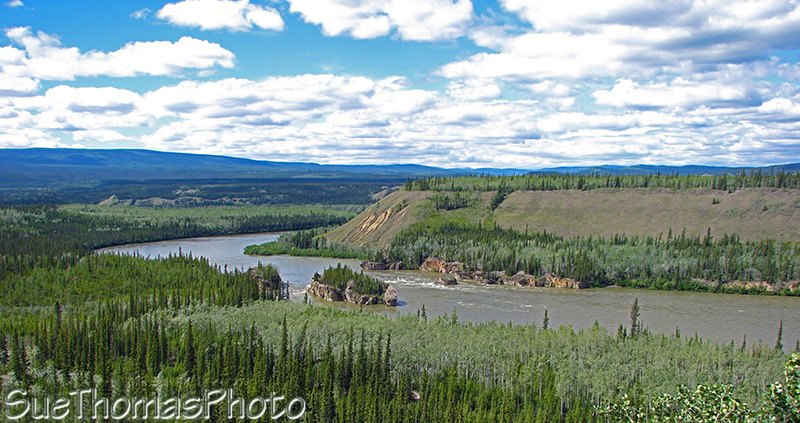 However, this passage presented a challenge for river pilots as they navigated their large sternwheelers between Dawson City and Whitehorse. In the 1900s blasting work began and continued for many years to widen the channel more than 20 feet. As well, a cable was attached to the sternwheeler to help guide the boats through the area. 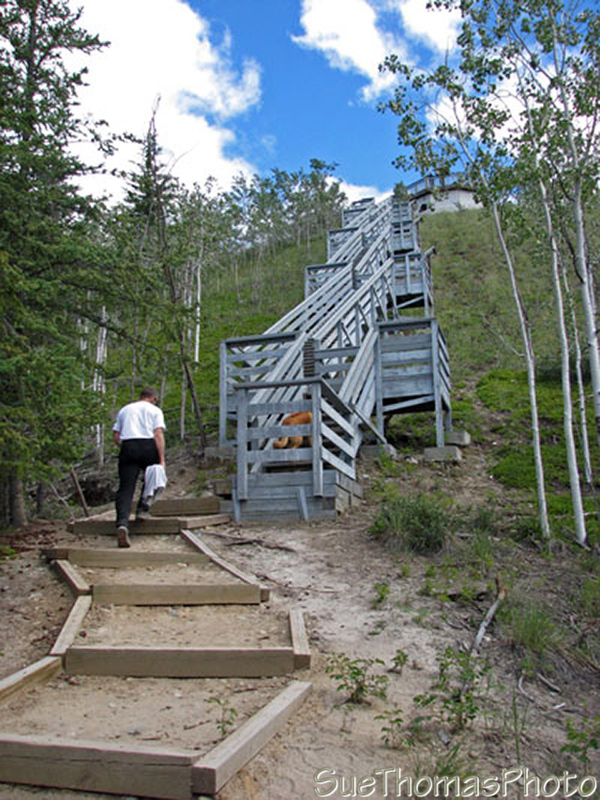 Many stairs and a path takes you to an observation platform for a closer view. It is a nice hike on a packed dirt path. Wear some decent shoes as there is a bit of scrambling up and down rocks. The very adventurous can stand out on the river's edge to get a good look; NOT for the faint-at-heart! What goes down must go up. I tried counting the number of steps as we climbed back to the highway. The Milepost (a guide of northern highways) said there were 219, but I counted 222. The second flight of stairs leading back to the highway; a test of endurance! There were tour bus people at the top oozing their congratulations as we bounced back up. Jake, our dog, was not exuberant but he did it too! 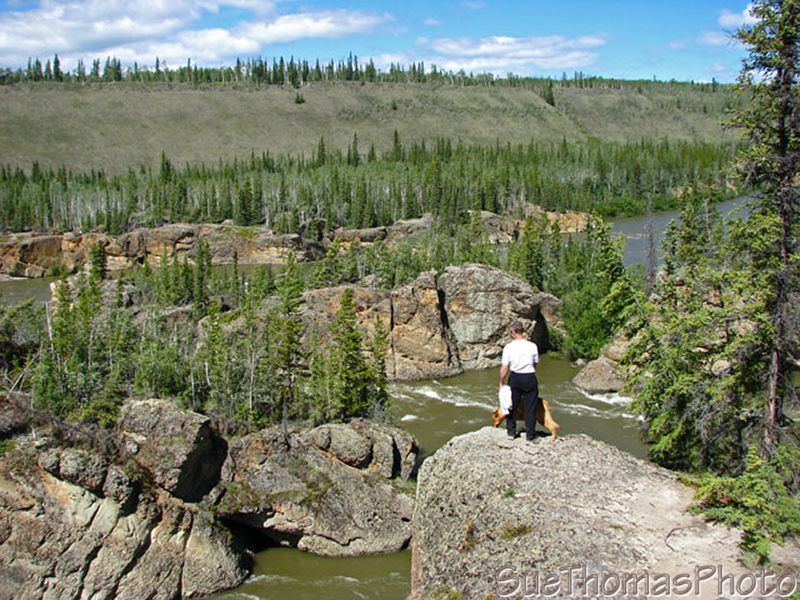 After catching our breath and having lunch at the rest area beside Five Finger Rapids, we continued north. 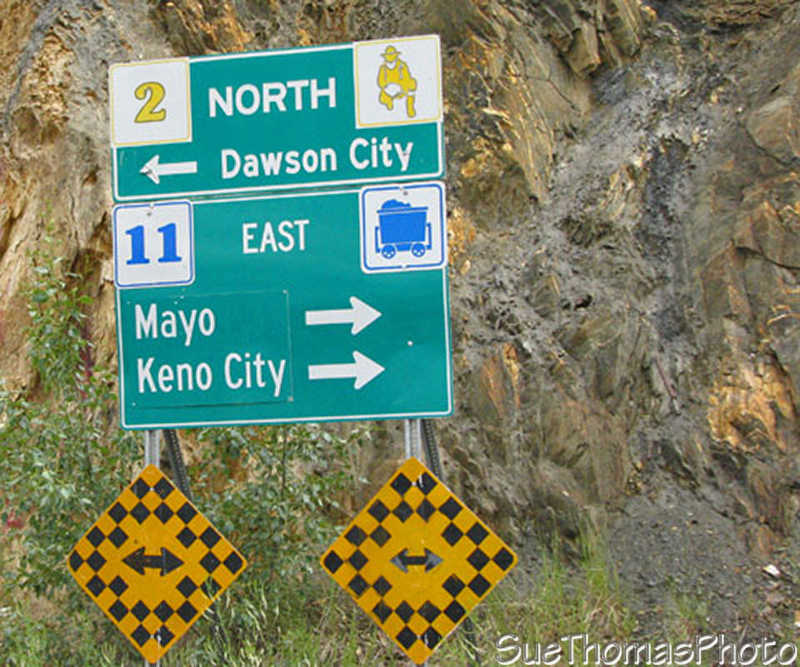 On the north side of the Stewart River bridge, travelers can turn left to continue to Dawson City on Hwy 2, or turn right on Hwy 11 for the Silver Trail and the communities of Mayo and Keno City. We turned right, towards Mayo and Keno City. Our destination for the night was Five Mile Lake Yukon Government campground; an ideal starting point for our next day's drive to Keno City. There is a good hiking trail around the lake. Other campers told us the fishing was not worthwhile. Steve grabbed his rod anyway and cast his line from shore. We enjoyed some nice Arctic Grayling for supper! Not many bugs here, so we had the fire going and enjoyed a pleasant evening outside. The evenings are very long this time of year! Jake has not been feeling well so we are often strolling with him at 3 a.m. and a flashlight was not necessary! Thankfully other campers are sound asleep, otherwise they would wonder about the wild woman in fuzzy slippers and robe stumbling along behind a big red dog.